What is the most powerful form of advertising? It is most certainly word of mouth. It is not only FREE but it can produce lots of priceless goodwill. According to an article, Word of Mouth is the Best Ad, in Bloomberg’s Business Week, traditional and electronic media advertising still lack the power of the word of mouth. 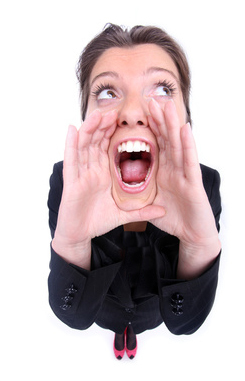 For word-of-mouth advertising to generate results it must be positive. Make sure that the “buzz”is positive, since negative comments often tend to travel twice as fast and have a life of their own. Be careful! Negative comments can sink a ship very quickly. 1) Make your front line employees into brand ambassadors. By their vast daily knowledge of the product or service, they are the best messengers for spreading the corporate message and for selling the product or service. 2) Ask your clients to provide testimonials. Record videos of your clients speaking your praises. If they won’t easily commit to a taped video, try offering them an incentive such as a free service or a discount. Written testimonials can also be added to the company website. These add credibility and accentuate your company’s positive image. 3) Ask clients to refer your business to other departments in their organization. Some of the best word-of-mouth support can be referrals to other departments within a company. Hearing that one department is using your company’s service can often be contagious. People often trust the word of their colleagues when it comes to hiring an outside vendor or consultant. 5) Reward clients that spread the word. Offer special incentives such as coupons, contests. Facebook page. Post signage at your place of work. For example, my son’s orthodontist posts a sign at the door: “The best compliment is the referral of your friends and family.” In yet another example, our veterinarian offers a discount of 10% on their next office visit to those who refer a new client. Indeed, the best compliment is a referral to someone else. 6) Designate a voice for the company. Look for an employee with a rich, yet distinctive, voice that helps to add character and defines the corporate brand. Use this same person’s voice for your outgoing voicemail message, phone on hold messaging, YouTube videos, DVDs and recordings that may reside on the corporate website. Over time your clients and visitors will become familiar with this memorable voice. This will be your company’s own word of mouth. 7) Be your own megaphone. Tweet, blast, blog, post, repost, fax, email, and text any good news about your firm such as awards, accolades, events, promotions. Go to meetings, seminars and network events and talk to prospective clients with a mini sales pitch about your company. 8) Attend and donate your services/products to charitable foundations. It is also a good way to help generate some good buzz about your company without spending lots of money but while helping a good cause. This will present you with many great opportunities to provide word-of-mouth advertising especially to well-connected patrons. Go ahead and spread the word! You’ll discover that it’s power cannot be beat. This entry was posted in Advertising, Clients, Promotions, Save Money, Successful Corporate Communications by Successful Corporate Communications. Bookmark the permalink. Great post! But what is the best way to promote your business through your personal social media accounts while not going overboard? How much is too much in that circumstance? You need to know when too much word-of-mourh advertising becomes word-of-overkill promoting. In other words, pull the plug at the point when your personal contacts have failed to respond or follow-up. Don’t oversaturate them with annoying social media blasts. Less is always more. Just a few words of advice: Don’t be a big mouth. Keep word-of mouth advertising courteous, professional and non-intrusive.